Some of the southeastern United States’ most beautiful snakes are also some of the hardest to find. During a recent survey of a small creek in southern Georgia, I was fortunate enough to come upon one of the coveted “jewels” of nearly all snake loving herpetologists. As I waded along in the cool water of the creek, scanning for basking or foraging snakes, I looked down at a particularly promising bottleneck in the creek that was comprised of some logs and accumulated leaf litter. I was expecting to possibly see a Watersnake or Cottonmouth, but instead I found a beautiful Eastern Mud Snake meandering through the wet matted leaves at the edge of the water. Eastern Mud Snakes, adorned with their shiny smooth scales of vibrant alternating red and black coloration, are amongst the most beautiful snakes in the world. To add to their appeal, is the fact that they are also very docile and never bite in self-defense. It is easy to see why they are so beloved by most herpetologists. 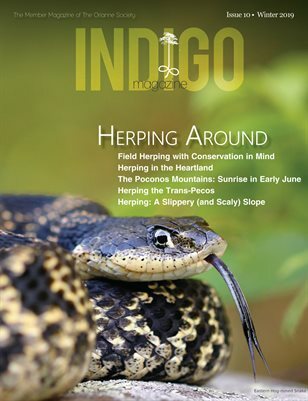 It was this recent encounter with this beautiful snake that spurred my interest in writing this article about the wide spectrum of preferred prey of different snake species native to the southeastern United States. Different snake species native to the southeast, and the rest of the world as well, have evolved to have a tremendous spectrum of preferred prey. Some snake species have evolved to prefer only a single type of prey, while other species of snakes will consume nearly any protein based food item that they can fit in their mouths. This spectrum is fascinating and it serves to help illustrate how some species can still thrive in some highly anthropogenically altered “habitats” while others can be devastated by the loss of a single prey species that they have evolved to rely upon for survival. Examples of snake species native to the southeast that have evolved to be very “open-minded” regarding suitable prey are numerous. Eastern Indigo Snakes, Black Racers, Kingsnakes, Coachwhips, and Cottonmouths (to name just a few examples) will all eat pretty much any animal (alive or dead) that they can swallow (including smaller members of their own species). These snake species are even not above scavenging road killed animals that they come across. Their open-minded palates and “cast iron stomachs” seem to be able to tolerate just about anything that they consume. The opposite end of the diet spectrum includes such species as Scarlet Snakes, Queen Snakes, Mud Snakes, and Rainbow Snakes. These snakes have evolved to be highly specialized in what constitutes suitable prey for their more sophisticated palates. Queen Snakes prey almost exclusively on recently molted Crayfish. Adult Mud Snakes prey almost exclusively on Amphiumas and Sirens (aquatic species of salamanders). Adult Rainbow Snakes feed almost exclusively on eels. Scarlet Snakes have evolved to rely heavily on eating the eggs of other reptiles. Snake species that have evolved to eat only a very narrow range of prey species, typically have also evolved morphologically to excel at capturing this narrow range of prey species. For example: Mud Snakes, Rainbow Snakes, Queen Snakes, Scarlet Snakes, Eastern and Southern Hog-nosed Snakes, and Crowned Snakes have all evolved specialized dentition to help them consume their preferred prey. These morphological adaptations do not stop at just specialized teeth, either. Mud Snakes and Rainbow Snakes have both evolved sharp pointed tails that they use to help acquire their slippery amphibian prey while Hog-nosed Snakes have evolved upturned shovel-like noses that they use to excavate buried toads out of the ground. Picky diets can be an Achilles heel for snakes once they are subjected to alterations of their habitats, though. Case in point: The Southern Florida Rainbow Snake is presumed extinct (the last confirmed sighting of one of these snakes was in the 1950’s) due to anthropogenic changes to their habitat within their very limited range. This snake was only known to occur in a very small portion of south Florida comprised essentially of a large creek. This creek was altered decades ago through damming and this led to the demise of the eels that inhabited the creek. Subsequently, this also led to the loss of the snake that relied on these eels for its continued existence. A powerful example of how anthropogenic changes to wildlife habitat can lead to a domino effect of lost species. A good example of a snake species that does very well in compromised habitats is the Black Racer. Black Racers have essentially no restrictions to what constitutes suitable prey for their palates. Black Racers tend to do well in highly developed suburban neighborhoods due, at least in part, to the wide variety of prey species that they can subsist on in these areas. A recent video that was shared online even showed a Black Racer snacking on several neonate Copperheads. Copperheads are one of the few venomous snake species that tend to be able to maintain viable populations in developed suburban areas. A significant contributing factor to why some Copperhead populations are able to thrive in developed areas, in addition to their excellent camouflage and relatively small size, is that they have a very diverse array of prey species that they will consume. A perplexing paradox is how some other snake species that also have extremely diverse diets have seemingly declined significantly in areas where they were formally quite common. Eastern Kingsnakes have become much less commonly encountered by many herpetologists in large portions of their range for reasons unknown. This serves to illustrate how difficult it can be to pin down what “factor X” is in the disproportionate decline of different snake species. In the case of the South Florida Rainbow Snake, it is obvious that the loss of the eels that they depended on led to the demise of that snake subspecies. However, in the case of the Eastern Kingsnake, we are left scratching our heads as to what is causing their apparent disproportionate decline in comparison to other native southeastern snake species that also possess diverse diets. Snakes are fascinating for many reasons, and certainly the huge spectrum of dietary diversity from one species to the next could be counted amongst these reasons. Additionally, the morphological adaptions that different snake species have evolved to acquire their prey is fodder for great interest and study. The natural history of different snake species is much more complex and interesting than what one may assume at a glance. However, if we take the time to give them more than a mere glance, our eyes will be continually opened to a fascinating world that was hidden in plain sight.